One step ahead in pursuit of excellence. Unflinching comfort and support to get you wherever your next hunt takes you! 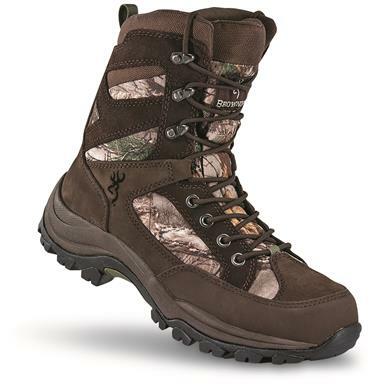 The Buck Pursuit Hunting Boot features Climate CommandTM technology…a combination of 100% waterproof construction and 400 gram insulation that delivers bad-weather comfort without bogging you down. The Buck Pursuit Boot is built on TruLastTM technology…specific performance foot-shaping technology that provides optimal stability and comfort for all active hunting applications. Ortholite® open-cell insoles complete the package, delivering long-lasting cushioning for a full day on your feet. Each approx. 8"h., 21 oz. Weight per boot (approx. ): 21 oz.